UGREEN fast wall charger is officially certified by Qualcomm. Compatible for All QC 3.0/QC 2.0 / Huawei FCP / Moto turbopower devices and all non-Quick Charge devices. It could charge compatible devices 4X faster than standard chargers, charging from 0% to 80% in just 35 minutes. Xiaomi Mi A1 / Redmi note 4 / Redmi 4x etc. 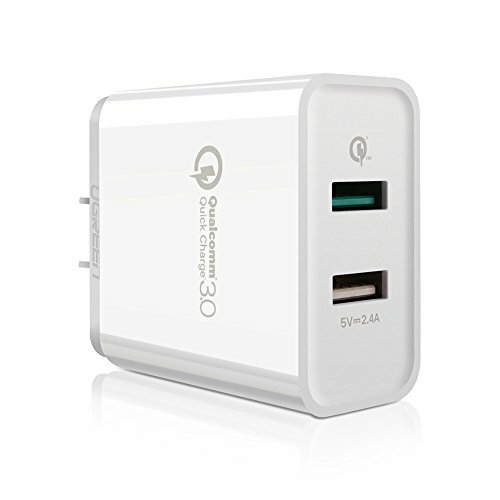 QC3.0 USB FAST CHARGER: UGREEN QC 3.0 Wall Charger is officially certified by Qualcomm. Compatible for All QC3.0/QC2.0 and Huawei FCP devices such as Samsung Galaxy S8 S8 plus S9 S7 Note8 S6 Note 5, LG V30 V20 G6 G5 Stylo 3, Motorola Droid Turbo 2/Droid Turbo, Moto G5 plus / G5 / E4 / E4 plus , Huawei mate 10 / mate9 / P20 / p10, Xiaomi MIX MIX2 / Mi Note 3 / Mi Note 32, HTC 10 U11 One A9, Sony Xperia XZ1 / XZ / XZs / XZ Premium / L1, ZTE Blade / Blade Z Max/ Axon 7/ M etc. INTELLIGENT TECHNOLOGY: Supports 3.6V-6.5V/3A, 5V2.4A, 6.5V-9V/2A, 9V-12/1.5A output, worldwide 110 - 240V AC input. Built-in double chips with quick charge identification and power controlling, intelligently controls charging rate and matches a proper rate for smartphones or tablets, keep the battery durable all the time.